Case reports and case series of cervical dissection following manipulation have been published. Despite their rarity, these cases are frequently publicized for several reasons. Patients are often young and otherwise in good health. Dissection accounts for 10–25% of ischemic strokes in young and middle aged patients . If dissection is caused by cervical manipulation it is potentially a preventable condition. Recent reports, including case control studies, have suggested an association between chiropractic neck manipulation and cervical dissection [5-10]. Notably, a recent study from the American Heart Association evaluated the available evidence and concluded such an association exists . This report did not include a meta-analysis, nor did it seek to classify studies and grade the body of evidence. We sought to examine the strength of evidence related to this question by performing a systematic review, meta-analysis, and evaluation of the body of evidence as a whole. Two study authors independently reviewed all articles (EC, ES). They selected any applicable studies for evaluation based on pre-specified inclusion and exclusion criteria. We included only human trials examining patients with carotid or vertebrobasilar artery dissection and recent chiropractic neck manipulation. We excluded non-English language studies. The articles were independently graded using the classification of evidence scheme adopted by the American Academy of Neurology [12-14]. A third author (MG) arbitrated any discrepancies in the class-of-evidence ratings for the included studies. Our search strategy yielded 253 articles. Seventy-seven were judged by all reviewers to be non-relevant. Four articles were judged to be class III studies, and two were rated class II. There were no discrepancies between the independent ratings (i.e., kappa=1). Studies rated class III or higher are listed in Table 1. Figure 1 outlines our process of selecting studies for inclusion in the meta-analysis. Figure 2: Meta-analysis of class II and III studies. 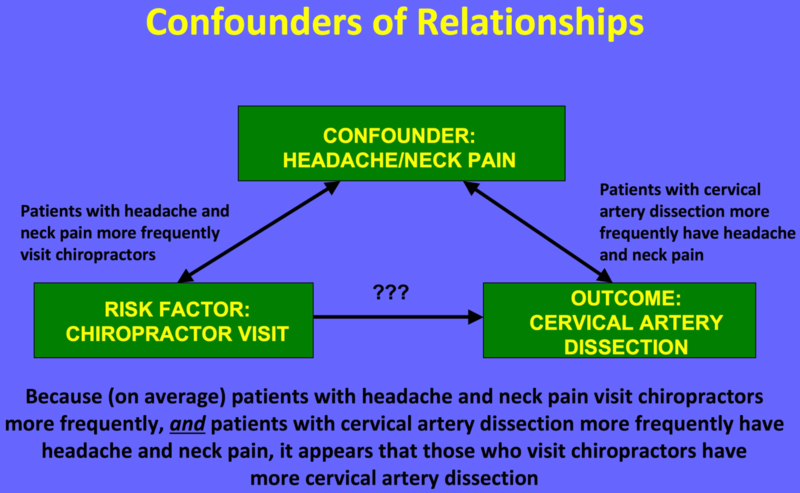 Fig 3: The association between a chiropractor visit and dissection may be explained by headache/neck pain, a likely confounder. Cassidy et al. hypothesized that, although an association between chiropractor visits and vertebrobasilar artery stroke is present, it may be fully explained by neck pain and headache . These authors reviewed 818 patients with vertebrobasilar artery strokes hospitalized in a population of 100 million person-years. They compared chiropractor and PCP visits in this population and reported no significant difference between these associations. For patients under 45 years of age, each chiropractor visit in the previous month increased the risk of stroke (OR 1.37, 95% CI 1.04-1.91), but each PCP visit in the previous month increased the risk in a nearly identical manner (<45 yrs OR 1.34, 95% CI .94-1.87; >45 yrs and OR 1.53, 95% CI 1.36-1.67). The authors conclude that, since patients with vertebrobasilar stroke were as likely to visit a PCP as they were to visit a chiropractor, these visits were likely due to pain from an existing dissection. 1. Strength of the association The association is modest. 2. Consistency of the association Four of five class II and III studies demonstrate an association. 3. Outcome specific to exposure As seen in Cassidy et al., exposure to a primary care doctor and exposure to a chiropractor are equally likely to result in CAD . In this case the outcome is not specific. 4. Temporal relationship A temporal relationship is necessary but not sufficient to establish causation. In this case, the onset of symptoms following cervical manipulation is variable and often delayed. 5. Biological gradient There are no data to support or refute a dose-response hypothesis. 6. Plausibility Are there increased rates of CAD in regions with increased utilization of chiropractic manipulation? No relevant data are available to address this criterion. 7. Coherence Tests on human cadavers have revealed that vertebral artery strains during spinal manipulative therapy do not place significant strain on the vertebral artery . A review of data related to this topic sponsored by the American Heart Association concluded that: “Current biomechanical evidence is insufficient to establish the claim that spinal manipulation causes [CAD], including data from a canine model showing no significant changes in [vertebral artery] lesions before and after cervical manipulation” . 8. Experimental evidence The available animal models do not support the association. 9. Analogous to proven association While severe trauma most certainly causes dissection, it may be debated whether the situation in chiropractic care is analogous. Table 2: Hill’s criteria for assigning causation to association . Riddle DL, Schappert SM: Volume and characteristics of inpatient and ambulatory medical care for neck pain in the United States: data from three national surveys. Spine. 2007, 32:132–140. Rothwell DM, Bondy SJ, Williams JI: Chiropractic manipulation and stroke: a population-based case-control study. Stroke. 2001, 32:1054-1060. Smith WS, Johnston SC, Skalabrin EJ, et al. : Spinal manipulative therapy is an independent risk factor for vertebral artery dissection. Neurology. 2003, 60:1424-1428. AAN (American Academy of Neurology): Clinical Practice Guideline Process Manual. Gronseth GS, Woodroffe LM, Getchius TSD (ed): AAN (American Academy of Neurology), St Paul, MN; 2011. Stroup DF, Berlin JA, Morton SC, et al. : Meta-analysis of observational studies in epidemiology: a proposal for reporting. Meta-analysis of observational studies in epidemiology (MOOSE) group. JAMA. 2000, 283:2008-2012. The Cochrane Collaboration: Cochrane Handbook for Systematic Reviews of Interventions (Version 5.1.0). Higgins JPT, Green S (ed): The Cochrane Collaboration, 2011. Lee VH, Brown RD Jr, Mandrekar JN, et al. : Incidence and outcome of cervical artery dissection: a population-based study. Neurology. 2006, 67:1809-1812. Hill AB: The environment and disease: association or causation?. Proc R Soc Med. 1965, 58:295–300.